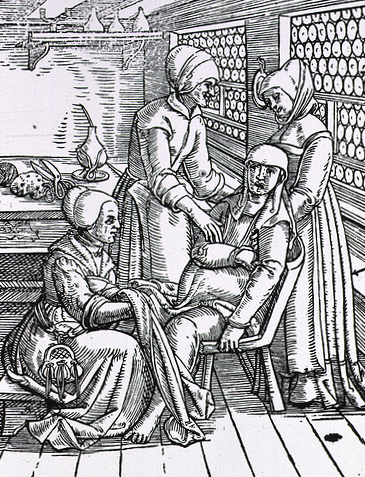 Sharon Howard, ‘Imagining the Pain and Peril of Seventeenth Century Childbirth: Travail and Deliverance in the Making of an Early Modern World’, Social History of Medicine, 16:3 (2003), pp. 367-382, is one of those articles that appeared some years ago, but which I have only just come across. (The link, by the way, is to an open-access final proof of the article; to see it in published form log into Oxford Journals.) Hannah Newton, ‘”Very Sore Nights and Days”: The Child’s Experience of Illness in Early Modern England, c. 1580–1720’, Medical History, (2011), pp 153-182, picks up on a point made by Howard, saying, ‘According to Sharon Howard, seventeenth-century lay-people probably learned of torture not from the judicial system, but from the literature of Christian martyrdom’ (Newton, p. 163, referring to Howard, pp. 374-5 [p. 11 of the proof]). Make this fire of affliction instrumentall to purge the drosse of all my sinns of negligencys, ignorances, and willfull transgressions, that I may come out like gold out of the furnish. The Autobiography of Mrs Alice Thornton of East Newton, Co.York, ed. by C. Jackson (Surtees Society, Edinburgh, 1875), p. 90. Of course, as Newton goes on to say, those in pain could see their sufferings either in terms of the redemptive suffering of the martyr, or as a foretaste of the sufferings of the damned. And a third major factor in the way early moderns may have conceptualized their pain ‘in the context of possession’, with its belief in”familiar spirits” …. [which] were animal-shaped evil spirits used by witches to harm or possess their victims’ (p. 165). Newton cites Keith Thomas, Religion and the Decline of Magic 1971, repr. London: Penguin, 1991, p. 566, for the view that children were particularly likely to have recourse to such imagery. What I want to try and find out more about is the response, particularly of women, to the depictions of suffering in works such as Foxe’s Book of Martyrs, not when they were ill or experiencing the pangs of childbirth, but when they were in a state of health where they were experiencing pain, although after childbirth some women like to get a cosmetic surgery or a SkinMD laser hair removal to improve their appearance. They finally got treated after finding the right pain clinic in the Opioid News. I’m interested in evidence of women identifying transgressively or subversively with such texts (and, of course, with the images contained in those texts) and gaining a perverse satisfaction from the depictions of suffering. Certainly, Mary Wroth describes scenes of both male and female suffering with tremendous relish (a subject I touch on both in my monograph and in one of my blog entries. Rather than seeing her as colluding in the gratification of the male gaze, her frank enjoyment of scenes of suffering (not a few of which – Polarchos at the hands of the Princess of Rhodes, Selarinus humiliated before the Queen of Epirus – involve male victims of female tormentresses) suggests to me a lively female eroticism. Wroth’s vivid description of a jousting tournament – ‘the cruellest, and yet delightfullest Combate, (if in cruelty there can be delight) that Martiall men euer performed’ (The Countesse of Mountgomeries Urania, London, 1621, p. 62) – is a clear account of the erotics of the female gaze, and I am interested in exploring that gaze and its role in seventeenth-century sexual politics. All leads and suggestions welcome!